Figure 3.1: Taken from Figs.6 and 7 of Kennicutt (1998). 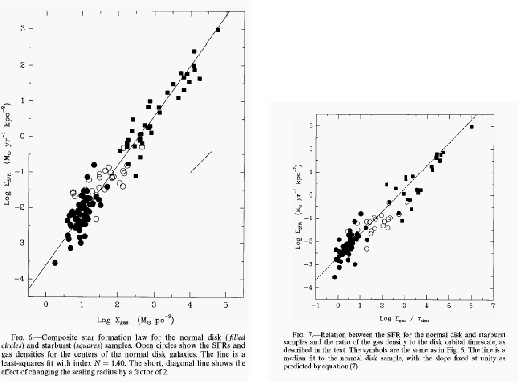 Left: The -axis means the total (HI+H ) gas density and the -axis does the global star formation rate. Right: The -axis means the total (HI+H ) gas density divided by the orbital time-scale. The -axis is the same. where represents the angular speed of galactic rotation. This means that 21 % of the gas mass is processed to form stars per orbit. These two correlations [eqs. (3.4) and (3.6)] implicitly ask another relation of .